It's a beautiful morning in Downtown Huntington. 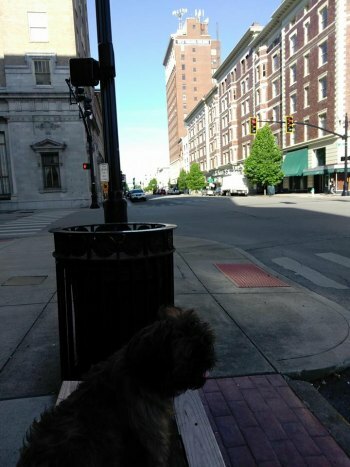 AJ Dawg and I are sitting on the corner of Fourth Avenue and Tenth Street literally watching Huntington slide out of the shadows and into the sun. The shadows have all but engulfed our city in the last few months and even weeks. On Easter Sunday, a day that signifies rebirth.... There were around twenty overdoses. Over the Winter, City Hall was in constant turmoil with the administration laying off police and fireman. City Hall is becoming a mecca for hope. The City was named America's Best Community and won $3million to aid in the rebirth. The Revitalization of Huntington has to be more than cosmetic or even economical. The City is hurting. Many have lost loved ones. Many have lost hope. Earlier this week, the City launched two drug raids and a prostitution sweep in an attempt to take our city back. Hope. A new Facebook page is sweeping through Huntington called Hope For Huntington. Along with The Heroin in You and other pages, the page is showing that Huntington is indeed recovering. Even though the emphasis has been on the overdoses, addicts have been recovering. The recoveries were something we weren't seeing. Now, we are seeing dozens of success stories. We are fighting back. It's hard to say we can win when so much has been lost but we have hope. Addicts are seeing that being an addict is not an automatic death sentence. Addicts are helping other addicts. We can pull ourselves and our city out of the shadows and into the sun. To post, you have to send a request to join the ground.